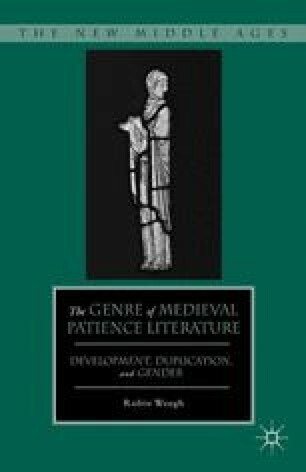 The main argument of this book is that, in certain medieval compositions, women become famous for patience in the way that men are famous for the traditional heroic virtues, such as physical strength and courage, and that this new kind of fame leads to a recognizable and specific genre of medieval composition: patience literature. Although scholars have long acknowledged that many and varying kinds of works emerged from the popularity of martyrs and from early accounts of these figures, many gaps remain in the account of how these emergent works then developed into stable and recognizable forms, with conventions and traditions all their own. The genre of patience literature, thus, demands a sustained attempt to record its literary history. It also demands a critical assessment that would trace its development from passions in the early martyrologies or passionals through to the works of writers such as Margery Kempe, Geoffrey Chaucer, and Christine de Pizan (to name but three possible subjects for the moment) because, for instance, the trials that Margery describes in her Book become more comprehensible if one treats them as self-conscious attributes of the patience genre, Grisilde’s outrageous passivity in Chaucer’s Clerk’s Tale is less alienating if one recognizes the tale as a sophisticated reductio ad absurdum of the patience genre, and Christine’s moral fundamentalism is less paradoxical if one interprets her version of the Griselda story as a precise satire of male-centered interpretations of patience literature and of knightly romances. The critical task is … to locate strategies of subversive repetition enabled by … constructions [of identity], to affirm the local possibilities of intervention through participating in precisely those practices of repetition that constitute identity and, therefore, present the immanent possibility of contesting them. In your patience you shall possess your souls.